Lush Lip Scrubs are hugely popular as an affordable way to keep lips in tip-top condition and with so many beautiful, bright lipsticks out for summer (which demand a flawless base), I thought I'd write a review with my thoughts. I believe that there are three lip scrubs in the permanent collection; Bubblegum, Sweet Lips and Mint Julips, with occasional limited edition versions. All are priced at £4.95, making them some of the most affordable lip scrubs that I've come across. I've never tried Sweet Lips (the chocolate version) and I didn't like Bubblegum, hence the reason for my review being of Mint Julips. When I first heard about Mint Julips, I imagined it to be inspired by cocktails and was expecting a mojito fragrance. It's actually tempting mint chocolate and is very reminiscent of After Eights, making it feel like a treat to use. I mentioned in my recent review of the Bliss Fabulips Lip Scrub (click here to read) that despite not usually liking tub presentations, I don't mind it for a lip scrub which is used in the bathroom. This is still the case for the Lush Mint Julips Lip Scrub, however, I'd definitely recommend applying this over the sink (this will also be convenient for rinsing it off, although Lush say that you can lick it off if you so desire!). 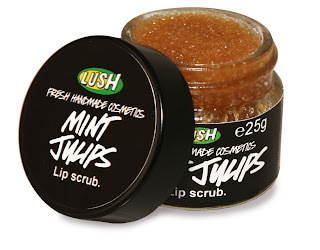 Unlike the buttery formula of the Bliss version, Lush Mint Julips Lip Scrub is much more densely packed with exfoliating sugar granules making it a dry, crumbly formula which is somewhat messy to work with. Having said this, I was able to tolerate the messy application as it really works to gently yet effectively exfoliate lips, ridding them of all traces of dry skin. It doesn't have the hydrating benefits of the Bliss version but I was impressed nonetheless and certainly feels that it delivers as a scrub.